Successfully Added Bluetooth Handsfree Car Kit to your Shopping Cart. The Bluetooth handsfree car kit that you have been waiting for has arrived. Compatible with all Bluetooth compliant branded cellphones and china mobile phones, as well as 3G mobile phones along with phone book upload to make things a lot more convenient for you. This simple and effective Bluetooth car gadget requires no special installation, just simply place it where you want and start using it immediately. This special Bluetooth car kit is so easy to use. 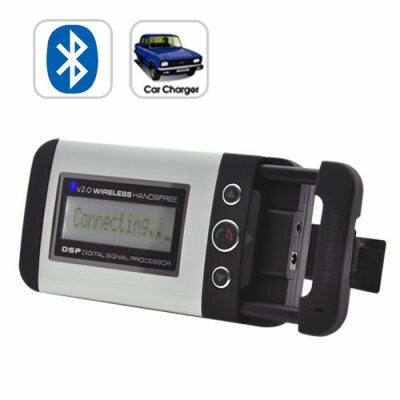 All you have to do is simply power up the Bluetooth car kit and pair it with your cellphone. This Bluetooth car kit makes using your mobile phone whilst driving easy and safe. No more reaching for your mobile phone and trying to answer while driving with one hand. This Bluetooth car kit makes sure that you and your entire family are safe when going on a road trip. This particular Bluetooth car kit is designed to be attached to the sun visor in your car. This unique feature is extremely convenient because you’re not always on the phone while driving, so the Bluetooth car kit stays out of sight. Have you ever walked into a cell phone retail shop in your local shopping mall? Have you noticed the outrageous price tags? Well, guess were all those mobile phone accessories are made? That’s right, right here in wonderful China. This Bluetooth hands free car kit is brought you at a factory direct china wholesale price. Click "Add to Cart" right now, and we'll express ship you a sample right away so you can see for yourself how amazing this Bluetooth hands free car kit truly is, and enjoy safe driving at the same time. Can I pair this Bluetooth device with my Motorola cell phone and iPhone 3G? Yes, you can pair this with any Bluetooth enabled mobile phone. How do I upload my phone book to the Bluetooth handsfree car kit device? From your cellphone, you will be able to transfer your cellphone contacts either as a whole or individually via bluetooth to the Bluetooth handsfree car kit. Great unit to use, recommended highly!